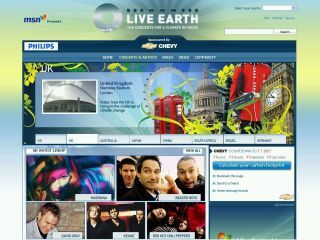 MSN has launched a website to coincide with the forthcoming Live Earth gigs taking place around the globe. The UK leg, at Wembley Stadium on 7 July, will be streamed live on the site . The interactive site includes interactive videos and information on Live Earth artists and venues plus photo galleries and downloadable Live Earth themed wallpaper. As the event draws closer the site will feature a video player to watch clips about Live Earth and the host countries. There's also a clever link to interactive maps provided by Microsoft's Virtual Earth , giving people a bird's-eye view of concert cities and venues. MSN has featured content from charities including Friends of the Earth as well as organisations such as the Energy Saving Trust and Stop Climate Chaos.